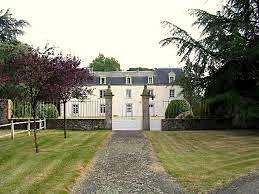 Le Manoir de la Thébline. Accommodation: Brouzils participants are provided single (when available) and shared rooms with breakfast and light lunch included Monday through Friday. (Breakfast only on weekends.) Some participants may be accommodated in Chavagnes, either in academic quarters or in a nearby convent. Apply early for greatest choice. Available at a supplemental charge: Three local chateaux and two modern hotels also provide single- and double-rooms, but a surcharge applies and early booking is essential. Recommended accommodation: Le Manoir de la Thébline in Les Brouzils (see photo). Contact us on info@brouzils.org for up-to-the-minute details on alternatives. Most sessions begin with an evening apéro and introductions and conclude with a farewell soirée. Transportation: London and Brussels are often the most inexpensive destinations in Europe for participants coming from the US. Ryanair and EasyJet operate frequent, low-cost air service between various British airports and Nantes. Connections from Brussels and from Paris to Nantes by rail are fast and frequent. Direct TGV trains link Charles de Gaulle airport in Paris with Nantes. Car rental is available in Nantes and in La Roche-sur-Yon. SNCF-TER trains provide transportation to Nantes from the neighboring village, l’Hébergement, or Montaigu, which is also nearby. Trains to and from Nantes run several times daily; travel time is approximately 35 minutes. Travel time to Les Sables, on the coast, is approximately one hour. For fares and schedules, visit the French railways site at SNCF.com. Car rental (Avis and Hertz) is available in Nantes and La Roche-sur-Yon. A limited number of bicycles are available to participants on a first-come, first-served basis. Local cell phones can be arranged; fees vary. Wireless internet is available in both Les Brouzils and Chavagnes.